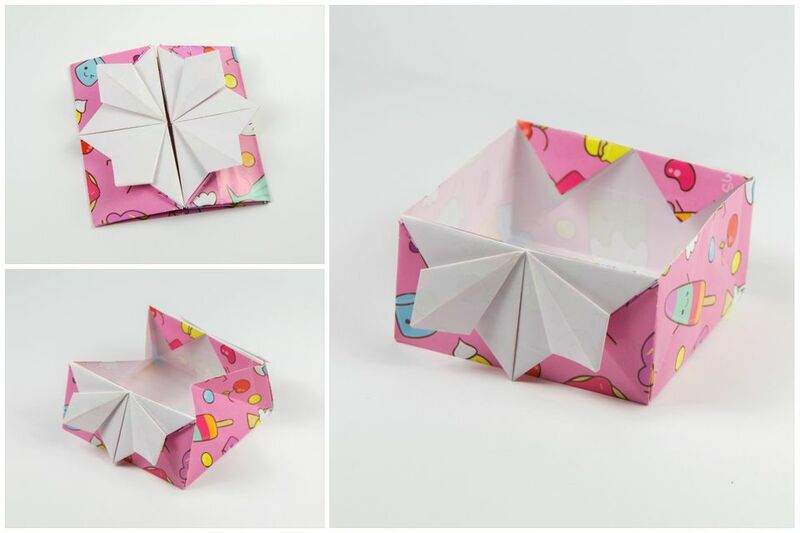 Learn how to make a pretty Japanese Origami Invitation Box! This little pop-up box is great to use as an invitation or an envelope to give money in. This origami envelope/pouch is an intermediate level origami. If you think this might be too complicated, give it a go. The steps are quite straightforward. This traditional Japanese origami envelope is based on this (much simpler) model. You will need one sheet of paper, you can cut a square sheet of paper in half. However the bigger your paper, the easier it will be. 1. Start with your paper white side up. The size of your paper needs to have a ratio of 1:2, so if your long edge is 20 cm, the short edge needs to be 10 cm. 2. Fold your paper in half, from left to right and then top to bottom. 3. Fold the top and bottom edges in to meet the central crease. 4. Flip the paper over to the other side. 5. Next, fold the left and right sides to meet the central crease. 6. Flip the paper back over to the other side and also rotate the paper. 7. Fold the bottom edge up to the central crease whilst letting the edge from the other side flip up. 8. Next fold the top edge down to the central crease as well. 9. This is the result. 10. Fold the top and bottom edges into the central crease too! 11. Open out your paper completely back to the start. 12. Flip the paper over to the colored side. 13. Fold the left and right sections inwards along the first creases from the edge. 14. Flip the paper over to the other side. 15. Fold the right edge over to the left, along the crease indicated. 16. Fold the top right and bottom right corners inwards diagonally. 17. Unfold the paper back out. 18. Repeat the same process on the left side. 19. Fold the paper back out. 20. Fold the top and bottom edges back in. 21. Bring the left and right (white) sections back to the center. 22. Open the flaps back out. 23. Reverse fold the diagonal folds. 24. Repeat on the left side. By the way, the paper used in this tutorial is thin origami paper, available on Amazon. 25. Refold the flaps back to their closed position. 26. Tug on the top right of the lower left section, pulling it over to the bottom right. 27. Flatten this squash fold making sure it's straight. 29. Insert the scissors so that you only cut one layer of paper. 30. This should be the result. 31. Cut the lower section the same way. 32. Take note of the red and green dots. 33. Bring the corner (red dot) down to the left whilst bringing the corner with the green dot up. 34. This the result. Repeat on the lower left section. 35. Fold the top left corner in. 36. Fold the corner over and behind. 37. Now you will be able to flip a little corner up and to the right. 38. Use a pencil to open out the flap. 39. Squash the little flap to complete that section. 40. Now you need to do the same on the lower section. 41. Open out the 'box' and fold the little triangles underneath and out of the way. 42. Repeat the process on the right-hand side. Make it easier by rotating the model so that the side you're working on is on the left again. 43. Now you can open out the box if you desire - or leave it shut. If your envelope box is springing open, leave it under a heavy book for a few hours. If you found this origami envelope a bit too tricky, maybe you need to start with a slightly easier model, such as the original envelope box or these super simple origami envelopes.